Doubleday Books for Young Readers, 9780385077255, 48pp. A timeless classic about the magic of boundless love that's been treasured for generations! Here is one of the most classic and beloved children's stories, with the original illustrations from 1922—the ideal gift for baby showers, birthdays, weddings, and holidays throughout the year. At first a brand-new toy, now a threadbare and discarded nursery relic, the velveteen rabbit is saved from peril by a magic fairy who whisks him away to the idyllic world of Rabbitland. There, he becomes "Real," a cherished childhood companion who will be loved for eternity. MARGERY WILLIAMS was born in London in 1881 and first came to the United States at the age of nine. For the rest of her life, she lived alternately in England and America. Her first novel was published when she was twenty-one, but she turned to writing for children in 1922 with the publication by Doubleday of The Velveteen Rabbit, the first and best-known of her thirty books for young people. Toward the end of her life, she lived in Greenwich Village, New York. She died there in 1944. WILLIAM NICHOLSON was born in Newark-on-Trent, England, in 1872. He illustrated several books during his lifetime, including the children's classic The Velveteen Rabbit, and was also a renowned portrait painter. Many of his portraits and still lifes hang today in museums and galleries throughout England. He was knighted in 1936, and died in 1949. Celebrate the Easter season with The Velveteen Rabbit, one of the most beloved of bunnies, as he celebrates his 75th anniversary! This special edition, complete with the original story and artwork as they appeared in 1922, remains a timeless classic in children's literature with over 1.5 million copies in print. 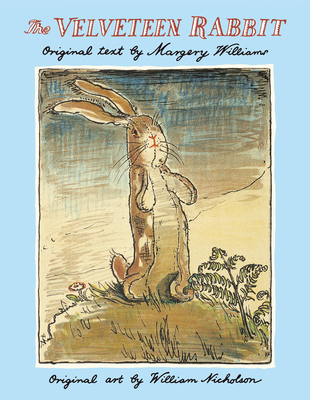 Ever since its first publication, this wondrous tale of the velveteen rabbit has delighted readers of all ages with its story of wisdom and love. Few other children's books so beautifully capture the spiritual meaning of Easter as does this simple tale of transformation and redemption through a child's unwavering love.